The type of services that NCI provide, include the following: Plumbing, piping, maintenance, slab leaks located and repaired, drain and sewer cleaning, water heater installation and repair all types of plumbing . Machinery and equipment hook up, utilities, pump systems, welding, and metal sculpture work. Also provide for all your industrial, commercial, resdential, new or remodel needs. NCI staff strive to keep up with the latest developments in equipment, improvements and other innovations that will help ensure that you obtain maximum use of your dollar. We will be happy to give you a free estimate on any plumbing, utilities, pump systems, excavating, welding or metal work. GOOD PLUMBING DOESN'T COST, IT PAYS! Noblitt Contractors are proud to announce our new service of video inspection and determining the location of underground pipe 2"-12" in diameter. By using miniature cameras which travel through inside of pipes, we see what and where the problems are, and even locate their depths under the surface. By indentifying and locating the cause of the plumbing and pipeline problems with our system we often eliminate excavation! At just 1.7" in diameter, this camera gives you sharp picture in 2" through 12" lines. It's twenty-one ultra bright white LED lights gives you plenty of light in up to 12" lines. Ideal for dye-testing, or to see what type of pipe you are in. We can also give you a video tape if requested. No more destroyed landscaping, jack-hammering out concrete or pulling permits and excavating the street, blindly searching for the problem. Hydro-Jetting Machine- Is a perfect maintenance option to clean lines out that may be slow draining, or simply to ensure that your pipes will last their full expectantcy. NCI has the top of the line equipment and technicans to operate them to save you time and money. Please call to give us a chance to provide a top notch service at fair price. 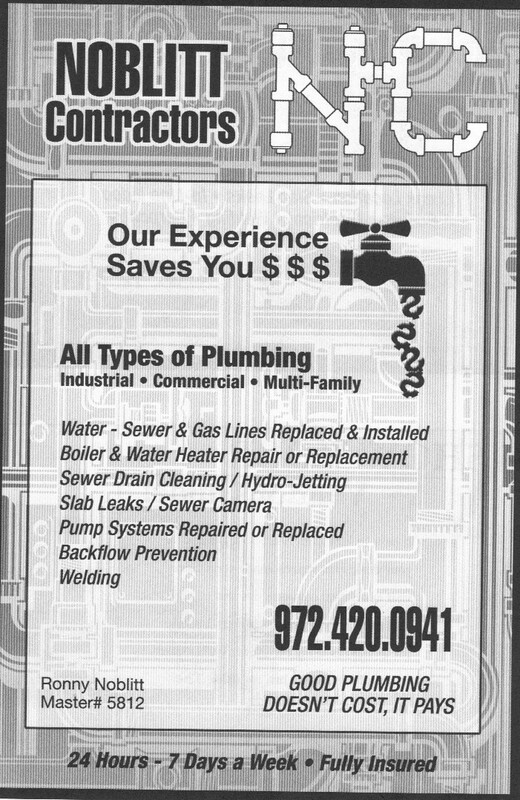 Good Plumbing Doesn't Cost,It Pays!